Welcome to the ChinaReport.com's digital introduction to the Li Yuan Peking Opera Theatre in Beijing, which is housed at the Jianguo Hotel in the center of the Xuanwu District of the old city. The Li Yuan Peking Opera Theatre is not one of the four great stages of Beijing, the legendary old Peking Opera theatres renowned from the late 19th and early 20th century heydays of Peking Opera, however yet today it is recognized as one of the main stages of Peking Opera in the city of Beijing. Established in the year 1999, when renewed interest in preserving the art of Peking Opera and a first influx of foreign visitors created a viable market, the Li Yuan Peking Opera Theatre of Beijing has been among the leading stages and proponents of Peking Opera in the city eversince, especially making the art more directly to the market for foreign visitors. Hence today it must be considered a historic landmark and bastion of culture which must be mentioned in any tourist guide to the city. The spacious and modern facilities of the theatre are inside the historical Qianmen Jianguo Hotel which was built after the foundation of The People's Republic of China in the year 1956 near the end of the glorious Sino-Soviet cooperation period. Initially established in 1999 but not much later again renovated in 2002, the theatre became the first such theatre in China to work with electronic sub-titling of Peking Opera plays for a foreign audience. The theatre with it's grand entry and extra large opera hall can fit up to a thousand visitors at one time and host shows virtually every night as it has been now for some 16 years continuously. The oldest and only original Peking Opera podium remaining in the City of Beijing, Zheng Yici represent the historic spirit of the Xuanwu Hutong and Beijing Folk Arts like none other. Go have a look and visit this colorful podium inside an ancient Ming Era (1368-1644 AD) Temple. It used to be the home theatre of Master Mei Lanfang himself. 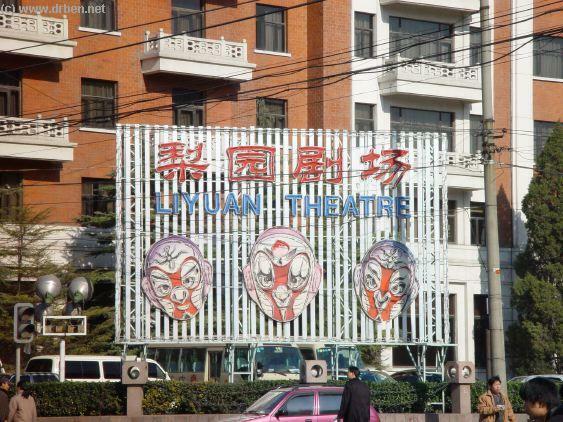 The Liyuan Theatre was constructed as part of the Jianghuo Hotel which stands to the south and outside of the demolished Hepingmen Gate and the well known Liu Lichang Culture Street. Opened in 1999, its exterior is clearly that of a large hotel. 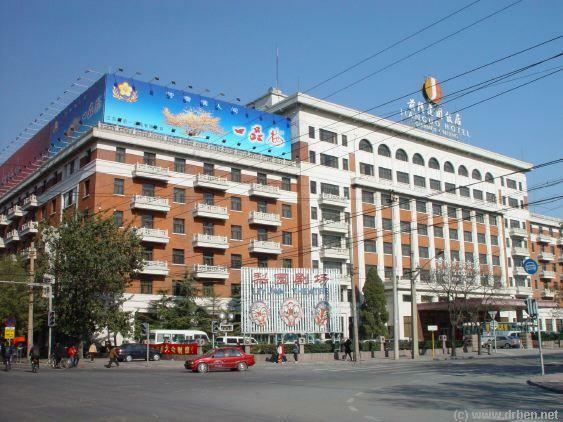 The hotel is recognizable as Peking Opera Theatre by means of the advertisements posted in front. 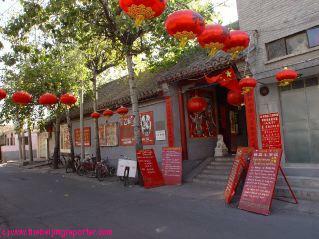 In the evening bright lights attract visitors to the Liyuan Theatre and the Jianghuo Hotel. and appreciation for Chinese cultural elements which had been persecuted during the previous 50 years of Communist Rule in the Peoples Republic of China. 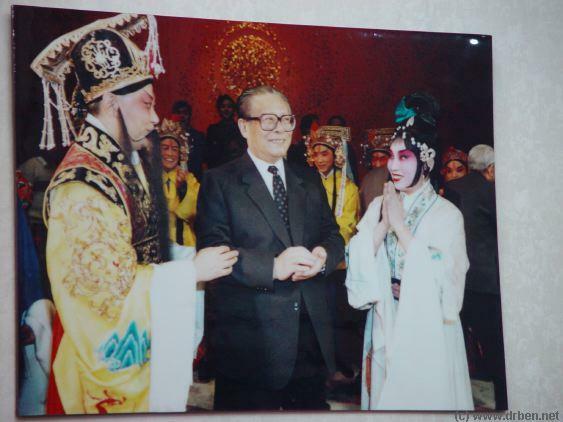 With abundant funding available, the entire theatre presentation has been made to allign with the traditions of Peking Opera as kept and presented by other older theares such as the legendary but long neglected Zhengyici Opera Temple and the historically famous Huguang Guild Hall only reopened as late as the year 1996. In keeping with the model stages, the reception area has been turned into a small museum of Peking Opera and the main stage hall hall has its interior design done such as to help recall an original experience and the atmosphere through design and decorations similar to old Beijing opera theaters. These decorations include walls aligned with chinese couplets and calligraphy, opera masks and Chinese folding screens (pingfeng). The Huguang Guild Hall and historic Peking Opera Theatre is situated at Yong An Road (Yong An Lu) which is an appropriate location for a Peking Opera Theatre as it is situated smack in the middle of the Xuanwu District in an area historically renowned for its entertainment of all varieties including various forms of stage art and folk art. 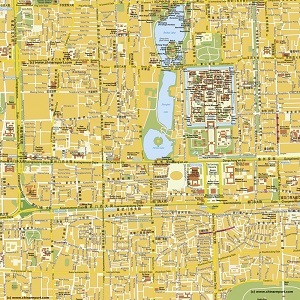 For those seeking directions, as one may find while studying adjacent available map, the location of the Jianghuo Hotel where the Li Yuan Theatre is housed sits exactly dure west of another famous location, the Tianqiao Intersection and the Wansheng Chinese Acrobatics Theatre. Phsycially, the distance is however quite large and to bridge the distance between the two following Yong An Road would involve a considerable walk. Another way to describe the location is to say that it lies south and outside of the demolished Heping Gate (Heping Men), however the hotel and theatre are situated several kilometers osuth of this location, although one may certainly walk there taking the road south from Liu Lichang Culture Street, a popular tourist location to visit. 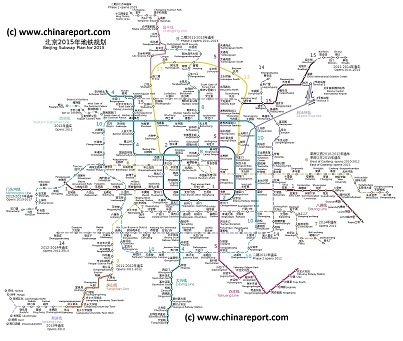 In terms of transportation, the Hotel and Theatre may be find situated near the Hufanqiao Subway Station of Line 7 of the extended subway/metro system of the city. Please do note that its is a brief walk around the block in the south-western direction to end up at the front entrance of the Hotel. When unsure while navigating the last bit, especially at night a possibility, keep a look out for the neon signs of The Beijing News, a building and establishment which stands across in the same street. Having left Hufangqiao Station subway station through exit C, head towards the lights and it will be hard to overlook the hotel theatre and its lights and crowds. The other station to travel might be the Taoranting Station of the the aqua blue line No.4, however a walk from this station to the location is slightly longer. Naturally, alternatively one may hire a cab ride to go directly to the hotel. Bus options are not advised, due to unexpected delays and travel time. Having found the Hotel one may buy or pick up tickets on the inside of Hotel, where as will find there is a spacious marbled reception hall with a seperate ticket office for the Li Yuan Peking Opera. Arrange for seats in one of the layers in the back, or pay more and have a table seat up front near the stage. As a traditional Art Peling Opera always involved live music and during each show time is reserved for the showcasing of this associated art and the people who produce the sound behind the show. Dont forget to applaude them when the time comes. 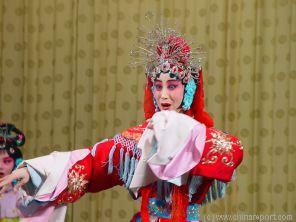 natural sounds that go with the art of Peking Opera. As one may find, often after a few visits, first timers become familiar with the main classical tunes and will go happily abouts whistling them while returning from the theatre. Fabulous artistic talent is available in the Capital of the great nation where an abundance of musical institutes may be found, so the quality of the sound at the Li Yuan Theatre, as it in other a rank theatres, is usually extraordinary. What you will be witnessing is truly the top of what the world has to offer in the field. Musicians and opera actors alike generally consider it a great honor to be allowed to perform at the Li Yuan Theatre, or the other two currently existing great stages of Peking Opera these being the Zhengyici Theatre and the Huguang Guild Hall. Therefor, it may well be said that the Li Yuan Theatre -together with its peers- has succeeded in proudly propagating this classical art, leading it into a new era and rightly placing it before a world audience of new fans. In between the plays, an announcer comes on stage to give a brief introduction (and allow props to be moved behind the curtain) and, as mentioned above, the theatre sports of full electronic translation service for foreign visitors, on which -by now- visitors can follow the play as translated in their prefered international language. For the cheaper seats in the back, an electronic screen gives the rough translations as subtitling. Altogether, the show experience is a lot of clean fun, a top of the line artistic experience, but also certainly a great family fun trip. Usually kids, as do some adults, will complain about the horrific noise produced by the background instruments during some parts of the show, but almost all kids love Sun Wukong, the Monkey King. The Monkey King character derives from the Ming Dynasty Era Chinese classic Journey to the West, an epic imaginary journey into the Buddhist realm which in turn is based on the historical figure of the Tang Dynasty Era (618-907 AD) Monk Xuanzang who traveled the paths of the Silk Road to India in order to claim Buddhist knowledge for the Tang Dynasty Chinese realm. Identified by the name of Sun Wukong, as derived from the book, the character is comical, naughty and performs unexpected acrobatic tricks for amusement. Together with the even older Zhengyici Temple Theatre the Huguang Guild Hall is recognized as among the four great traditional stages of Peking Opera as once found in the city. Reactivated in stages since 1996, the historic building has an all wooden Opera Hall and serves a truly unique experience. tradition, lighter elements dominate the show in general. Among things, there is a comical duo and also sword fighting and acrobatic stunts which are sure to appeal to wider audience including the young. As is another feature of Peking Opera, even though one may not understand the various histories attached to plays, one is always sure to be able to recognize the role of the character simply judging his or her facial appearance. And it is a pleasure to do. As one will find, faces are exactly as one may expect to reflect the role best, and make things clear even for the deafest and blindest person in a back row seat. At least, that is the tradition. Those who are afraid of going thinking their evening will be filled with mothball noble ladies and generals recalling bygone era's no one really remembers anymore can feel reassured. Ancient art does not have to be old fashioned at all, as one may learn through this popular folk art and custom. 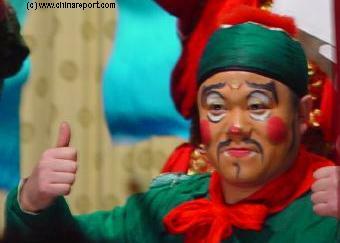 Usually, facial expressions combined with bodily gestures and postures communicate the intentions of a Peking Opera character but the effects are underlined by having accordingly colored costumes as well as lavish facial paintings, which can be surpising. Some characters have dual modes, or two sides, which will again be reflected in the facial paintings for all to see. 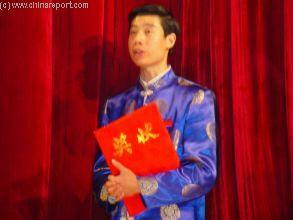 It is one of the humoristic elements which make Peking Opera such a special stage art. schemers, angry power hungry men, ladies in distress or exclaiming things to the contrary and of course the honorable heroes to keep a straight moral line in the end. Keep a close watch and maybe return a few times in order to get everything that happens on stage, which is really a lot. 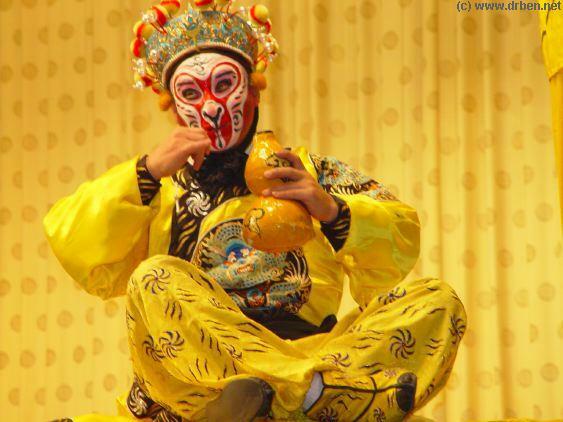 No Peking Opera review can do without the peculiar Monkey King character, so expect this acrobatic figure to pull some funny capers and impressive acrobatics during the show. You may want to have your camera at the ready there. Although this announced no where, especially at the Li Yuan Theatre actors are known to take moments of pose, making sure that tourists can get their best performance acts captured on video and video, as they often do. If you are there with a camera, please be polite and try and disturb the other audience members as little as possible. 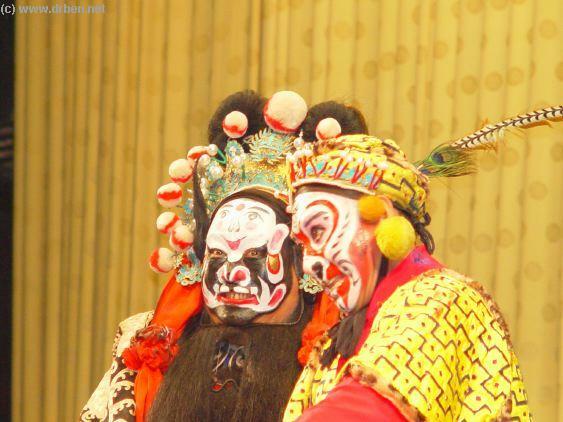 Comical roles are part of any Peking Opera evening at the Li Yuan Theatre and no one leaves without having had a laugh. Fantastic costumes and rip roaring explorations into Chinese Folk Culture at the Li Yuan Theatre in Beijing. Basic facial paintings or more intricate facial masks create proponents whos chracter may be read from afar by the audience making the understanding of the art easy for anyone. Performances are given every night starting at 7:30 Pm and ending at around 8:40 PM. As described on the following pages, a show consists of four separate parts or plays. The first play is a Farewell to my Concubine, which basicly is an international play which however is brought in the full traditional peking opera style. Watch closely for effects. which is not widely know in foreign lands, is said to have happened during the Chinese Song dynasty. Play three and four are subsequently named Bird in a Cage and Drunken Beauty. All of these are classic which however offer a very varied introduction to the art. Read on on the next page for a more complete description of the plays, their history and the reasons why they are featured in the show of the Li Yuan Theatre. The directions of the show and the performances in it are the work of one of the leading Opera Troupes in China, these being "The Beijing Jingjuyuan Theatre" which was founded in 1979 under China's Ministry of Culture. Their productions are mostly based on the works and traditions created by the four of the most historical Peking Opera actors of our times: Cheng Yanqiu, Mei Lanfang and Xun Huisheng and Shang Xiaoyun. 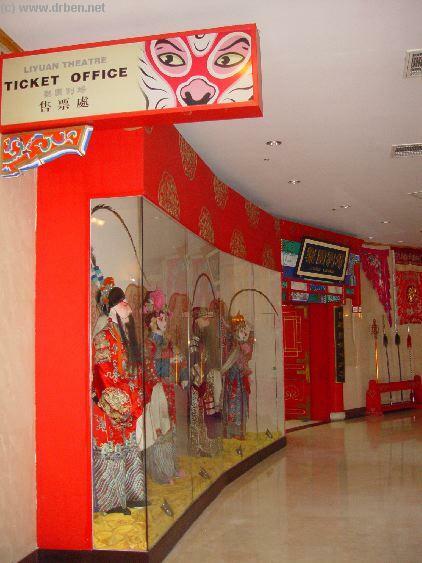 The ticket office is found inside the hotel lobby where one enters a parallel world of Peking Opera and bright auspicious colors.